How to create a new task and share it with your team. 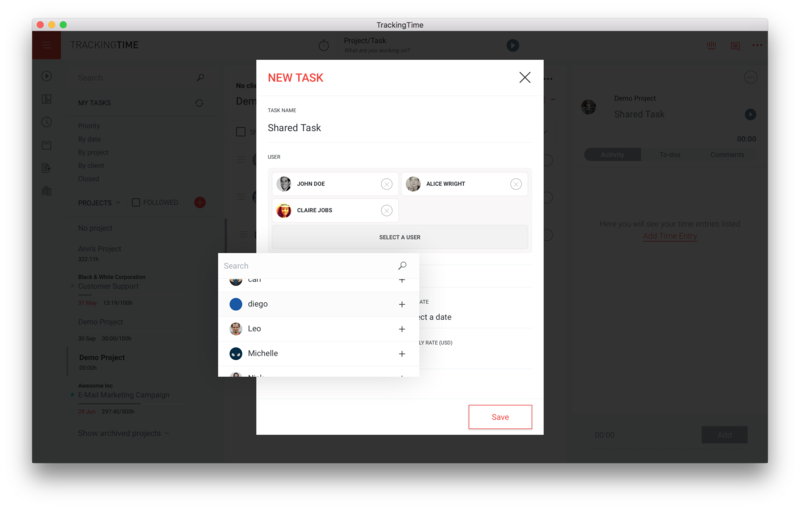 Tasks are how you break down your work and track your team's hours in TrackingTime. They can live on their own or within a specific project. 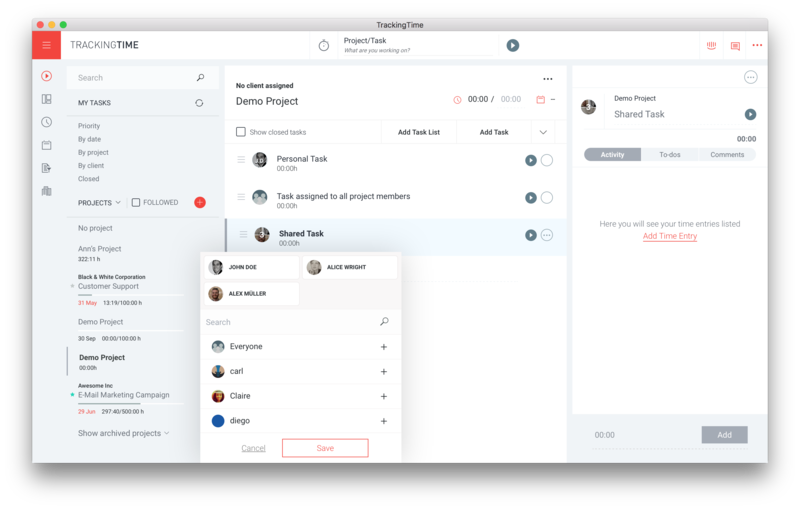 Projects are simply a way to group tasks together. For instance, you might have a task to write a project proposal, and another teammate is responsible for reviewing it. You can add these tasks in TrackingTime and let your team track the time they spent working on them. The easiest way to add a new task is in the Tasks section, by clicking on the "Add Task" button. The following pop-up will appear where you can enter the task details. Task name: Give your task a name. Up to 500 characters are allowed. Task names are not unique. This field is required. Users: Select the task assignees from the list. A task can be assigned to one or more users. This field is required. Project: Assign the new task to a project. When you click on this field a list of your existing projects will appear. You can either select one of them or enter a project name to add a new project and assign the task to it. Estimated time: Enter the amount of hours you think will be required to complete this task. Due date: Click on ‘Select a date’ to choose the date by when the task should be completed. Billable: Specify whether we should mark this task as billable or not. Hourly rate: If the task is billable, you can enter an hourly rate for it. To-dos: You can break big tasks into smaller, achievable goals. Break down everything that needs to get done in order for this task to be completed. When you're done entering the task's details, remember to click 'Save' to save to add your new task. The pop-up will be closed and the newly created task will be added to your list. By default, new tasks are assigned to everyone in your team – or within a specific project in case you're adding a project task. Tasks assigned to everyone are visible and trackable by all team members, or by all project members if you have associated the task to a particular project. If you want to create a task for yourself click on the user icon and select your user name from the list. Personal tasks can only be tracked in realtime by you. However, account administrators and project managers can always add time entries to personal tasks assigned to any account user and edit them. To assign a task to more than one person, select the users who will be working on this task. Task assignees can be updated anytime as required.